K9 Ballistics Cujo Cot Dog Bed Review: Is an Elevated Bed Right for Your Dog? If you’re looking for a K9 Ballistics Cujo Cot dog bed review, chances are you’ve already given some thought into whether an elevated dog bed is right for your pooch. Or maybe you came across the brand in your search for the ultimate chew-proof dog bed. 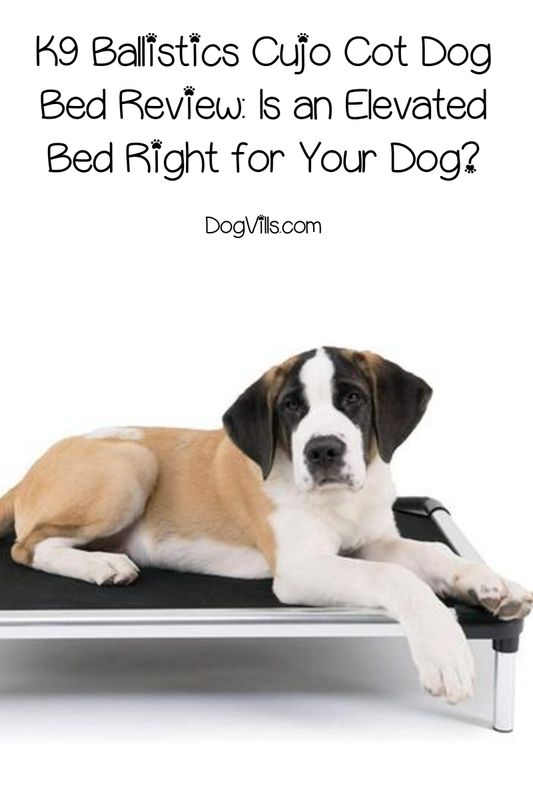 These types of beds do have a few advantages over the standard mattress-like dog beds. Today, we’ll talk about those advantages, as well as a few drawbacks to a raised dog bed. Then, we’ll discuss one of the most popular brands: the K9 Ballistics Chew Proof Dog Cot. What is an elevated dog bed and why would I want one? As the name implies, an elevated dog bed is lifted a few inches off of the ground, usually with an aluminum or PVC pipe frame. Check out the table below to see the benefits and drawbacks to an elevated dog bed. Provides even support across your dog’s body, making it ideal for dogs with joint issues. Senior dogs may have a harder time climbing up onto it. Allows air to circulate & keeps your dog cooler during the hot summer months. Your dog might not like the elevated style and flat-out refuse to use it. No stuffing to chew apart! No padding for added comfort! Easy to clean. Most elevated beds can be hosed off. Assembly required, and most don’t come with adjustable legs, so what you see is what you get. As you can see, an elevated dog bed is great for chewers and dogs who spend a lot of time in hot environments. It’s also good for senior dogs who need even support, although you’ll need to make sure they’ll actually use it! Now that we know a bit more about this style of bed, let’s check out that K9 Ballistics Cujo Cot dog bed review! First things first, while the bed is widely known as the Cujo Cot, K9 Ballistics simply calls it the Chew Proof Dog Cot on their website. On Amazon, it’s called the K9 Ballistics Indestructible Elevated Raised Metal Frame Dog Bed. Long winded, right? Cujo Cot is a lot easier to remember! Brands have to cram a lot of keywords into titles so that they come up in searches, which is why you’ll often see a 20-word name for a bed that used to have just two words. I just wanted to point that out to avoid any confusion. I don’t want you to see one name and think I’m talking about the wrong bed. Wondering why the bed is named after Stephen King’s nightmare-inducing rabid dog ? Read the chew proof ratings and, trust me, it will all make sense. Fortunately, (hopefully! ), our dogs aren’t quite as destructive as the poor bat-bitten Bernard (honestly, I cried through the whole movie. Poor Cujo! ), but I think many of us can relate to having a Captain Destructo in our houses. With a 5/5 rating, even Cujo would have a tough time destroying it! The main bedding (aka the sling) is made from Ripstop fabric, a strong nylon that resists ripping and tearing. Thanks to that nylon, the bed is also water-resistant, odor-resistant, and even dirt-resistant. The frame itself is made from 100% aluminum, making the entire bed incredibly hard to chew. It’s very easy to clean. Just hose it down! Can be used both indoors and outside. Easy to put together, just screw in the legs. Cujo Cot comes with a 120-Day Chew Proof Guarantee. If your dog manages to chew through it, they’ll replace the bed for free. While that’s not nearly as long as the warranties on some of my other picks for the best dog beds, it should be long enough to figure out whether or not your dog can destroy it. However, they’ll only replace the bed one time, so if Fido destroys the second one, it’s game over. My girl Freya is highly destructive, so obviously I love the chew-proof factor. I kid you not, she once gnawed a hole through a super strong $400 nylon-covered bean bag chair in under 30 seconds! That thing survived three other dogs and my son, but she rendered it useless in under a minute! If I wasn’t so mad, I’d be impressed! I also love that replacement fabric is reasonably priced. If your dog does manage to get through the nylon fabric, you can order a new sling from K9 Ballistics for under $30. Also, when ordered separately, the fabric actually has a 180-day guarantee. K9 Ballistics is passionate about giving back to animals in need. When I compared them to other elevated dog bed brands, they emerged as the clear winner in this department. Every Dog Deserves A Bed Project: they donate their highest-quality beds to charities, shelters, and other rescue groups, with an emphasis on no-kill shelters and fostering groups. One For the Wild Initiative: they make a donation to protect wildlife habitats with every bed sold. I have very few criticisms, but a balanced K9 Ballistics Cujo Cot dog bed review needs to address both the pros and cons, right? Towards that end, there are a couple of things I would change. The warranty: 120 days (about 4 months) is a very short warranty compared to other comparably priced beds. I’d feel a lot better if they boosted that up to 1 year, or even a sold 6 months. Where it’s made: for the life of me, I cannot find out where the Cujo Cot is made. While I’m not as picky about dog beds as I am about treats and toys, I still like to know this information. Weight limit: again, I cannot seem to find a clear-cut answer on the weight limit. Some customers say that they use the bed for their 200+ lb giant breed dog, but I feel like this should be very clearly stated in the description. As you can see, two of these “cons” are more about a lack of information than complaints about the bed itself. 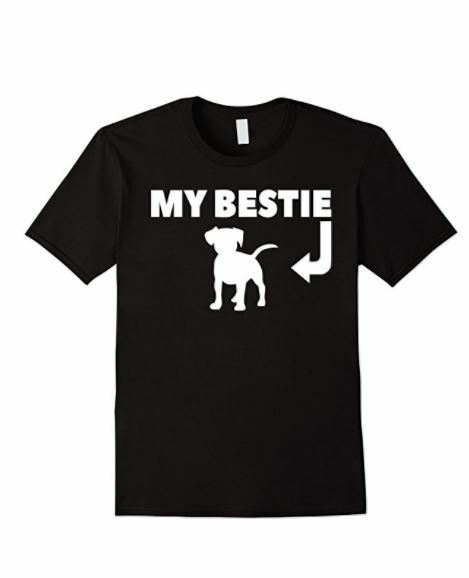 As someone with a dog who can chew through a $400 strong nylon bean bag chair in under a minute, I would get this just for the chew-proof factor itself. I also really like how an elevated bed helps keep dogs cooler and more evenly distributes their weight. Basically, if you have an aggressive chewer or a senior dog who needs a little more even support, the Cujo Cot is a great choice. Do you have anything to add to my K9 Ballistics Cujo Cot dog bed review? Share below!